Do you remember the butchers, or the bank (now believed to have been Lloyds, then followed by Martins) that was at that corner before they extended the Maynard Arms, now a car park occupies their space. 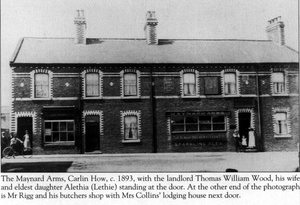 From the left the properties were Riggs (butchers shop), Mrs Collins (lodging house) and the four panelled window of the Maynard Arms (landlord was Thomas William Wood). Information kindly supplied by Derick Pearson and Jean Wiggins. I believe it was LLoyds and possibly followed by Martins bank. Thomas William Wood was my children’s great grandfather. It all seems now a long time ago. 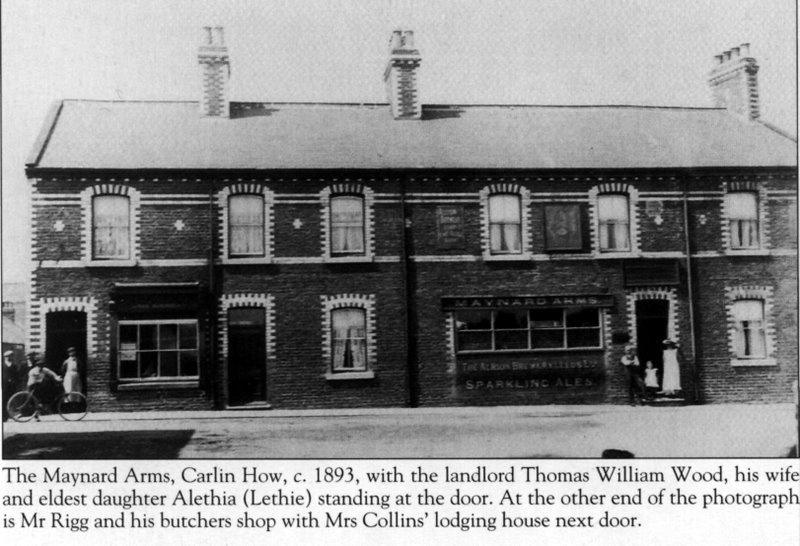 I have found a picture of the Maynard Arms at what I think is the beginning of the First World War. It shows a group of soldiers, two of them with bicycles, standing outside the pub under the direction of a sergeant with a monumental ‘tache. We’re coming on holiday to Staithes in a couple of weeks and it would be lovely to be able to bring the picture back to the pub. My grandad Harold Bowling became landlord at the Maynard Arms around 1929 I think. He had been steward at the club from 1911 when it opened. Quite a number of people will remember his son Harold or Tim as he was known he became a policeman and was awarded the BEM for saving people during a storm in Staihes.